I promise to use it only to send you Motivational Times. The briefest definition of motivation is ‘The activation of goal-oriented behavior’ . . . to create enthusiasm and incentive, and generate the desire for action. 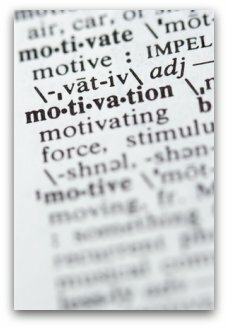 Often connected to a goal-oriented outcome, these definitions of motivation can apply to groups, individual or to the self. There are two basic types of Motivation, Intrinsic and Extrinsic. •	Intrinsic motivation is based on an individual or self, being enthusiastic. Enjoying the work at hand is a fire within that desires more pleasure thus being drawn toward greater outcomes. This may be fired by goals or by the simple joy of enthusiasm. •	Extrinsic motivation takes its rise outside the individual. Training for an award, to win a prize or earn a bonus. This may amount to some coercion within the workplace. Employers may set monetary bonuses related to production goals. Three general areas of motivation are, Motivation in the workplace, Personal Motivation, Sports Motivation. •	Definitions of motivation in the workplace . . . employers wishing to increase or speed up production levels. Maximizing the effectiveness of existing staffing levels for example. •	Personal Motivation. Individuals striving to achieve personal goals. A study of high achievers will reveal the one quality they all share is the ability to generate their personal motivation. •	Sports Motivation. Competitive sport demands the peak performance from an individual or team. Often, stimulated with the help of a coach. Abraham Maslow’s research and definition of motivation reveal a hierarchy of human needs that has to met before the individual could move to a higher level. His personal motivation would focus on these needs until they were met it. The human priority is . . .
g) To connect to something beyond the ego or to help others find self-fulfillment and realize their potential. According to Maslow, an individual is ready to be motivated or act upon personal growth only if when these deficiency needs are met. All motivation is Self Motivation . . . where there is no or limited desire within an individual to become energized or enthusiastic no amount of outside stimulation will prove effective. Want To Make Some Lasting Change in Your Life?